As Dover expanded the Dour was straightened into wide, shallow, hard-edged channels. This reduced the speed of the water, and allowed silt and pollution to settle on the river bed. Trout need clean gravel in which to lay their eggs, and larvae for dragonflies, damselflies, caddis fly and other invertebrates on which fish feed prefer a silt-free habitat. 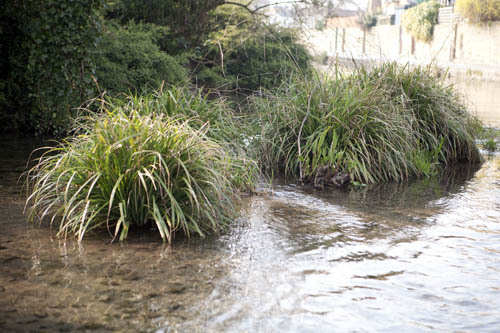 The flow of the river has been managed by building up some areas of the banks and with planting to give a narrower, fast-flowing central channel surrounded by slower flowing edge areas. The deep water eddies prevent silt from settling on the river bed, carrying it away and add oxygen to the water. The shallow slow moving water and plants near the river’s edge provide cover for birds,and a refuge for fish and invertebrates. Stands of reeds and water plants create eddies and currents which scour the river bed of debris.